What did it look like for the whole community, including over 40 elected leaders, to come alive around the experience of riding transit? What started as a small idea blossomed into a massive, community day of action across South Florida that engaged community leaders and locals in riding public transit, dialoguing together on social media about their experience, participating in transit-related events around the city and fueling the commitment to strengthening our transit system. Posts and tweets started coming in before the actual day as locals and elected leaders began mapping out their routes and preparing for their day. On Public Transit Day, residents walked, biked or used rideshare to get to their nearest transit stop, many for the first time. Activity picked up on social media early on December 9 as commuters packed buses and trains. Civic Center Metrorail Station during morning rush hour. Our friends at the Knight Foundation helped us remind everyone to ride transit for Public Transit Day. Miami-Dade County Commissioner Daniella Levine Cava received support from a sympathetic bus driver when she had a bit of difficulty loading her bike on the bus' bike rack. Miami Beach Commissioner Kristen Rosen Gonzalez’s bus never arrived so she called 311: “It [the app] said it [the bus] would be arriving in 7 minutes - that was roughly 3 minutes ago. The bus never came, and when I re-logged into the app, it said my bus would arrive in 40 minutes. Do you know where my bus is?” A patient 311 operator let the commissioner know that her bus had broken down; a re-route led to a ride on a Miami Beach trolley, a system the commissioner had previously opposed funding for. The experience shifted her perspective. County Commissioner Jose 'Pepe' Diaz rode the bus and handed out one-week transit passes to other transit riders, and City of Miami Commissioner Ken Russell used a combo of Uber, the Metrorail and the Metromover to get where he needed to go. Joined by Miami-Dade County Commissioners Daniella Levine Cava, Rebeca Sosa, and Esteban Bovo, North Miami Mayor Smith Joseph and Mayor of Palmetto Bay Eugene Flinn, Miami-Dade County Mayor Carlos Gimenez joined us on the Metrorail and Metrobus to celebrate Public Transit Day and demonstrate his commitment to strengthening our public transit system. 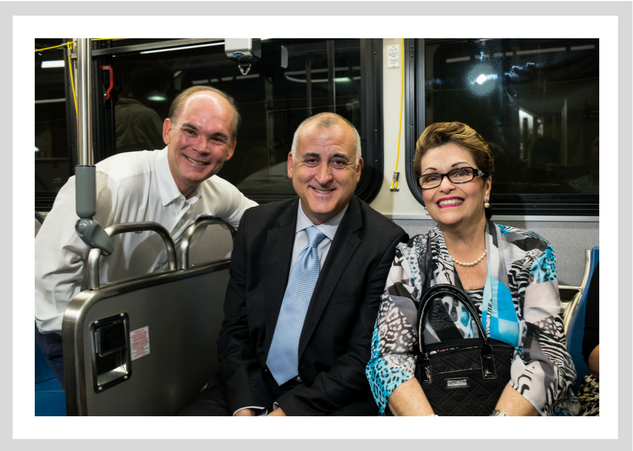 Palmetto Bay Mayor Eugene Flinn, Miami-Dade County Commissioner Esteban Bovo, and Miami-Dade CountyCommissioner Rebeca Sosa take the bus on Public Transit Day. Events throughout the day celebrated the day of action with free and discounted snacks and fun. The City of Doral rallied their community around Public Transit Day and trolly riders received 10% off purchases at participating businesses. Lucky rail riders received free coffee and snacks at the Civic Center station, presented by Jackson Health System. Public transit advocates rode transit on their lunch break and joined the transit conversation at Lunch @The Underline at the Brickell Metrorail Stop. The Underline demonstrates the important role great public spaces play in shaping and improving our public transit system. The Lunch @The Underline showcased how the public areas around the Brickell Metrorail Station are being transformed into inviting places for people to meet and mingle. In addition to free snacks from The Salty Donut, Wynwood Parlor, Harmless Harvest & EVOS, attendees had the opportunity to talk and learn about public transit improvements with the Miami-Dade Metropolitan Planning Organization (MPO) and the Miami-Dade Department of Transportation & Public Works. Transit users stopped by restaurants throughout the city to partake in Public Transit Day snacks - La Fresa Francesa gave out free lemonade and Books & Books handed out free coffee for transit users showing their transit “proof” - a selfie or a post on transit using #PublicTransitDay. Museum-loving transit users received free admission to the Perez Art Museum Miami, the History.Miami Museum, the new Cuban Diaspora Museum and Fairchild Botanical Gardens - and The Wynwood Yard featured a special Public Transit Day cocktail. Interested in combining your transit experience with some local culture? Evening transit riders partook in Buskerfest, an annual street performance festival in downtown Miami. This year featured approximately 40 groups of local musicians, acrobats, comedians and dancers at Metromover stops. 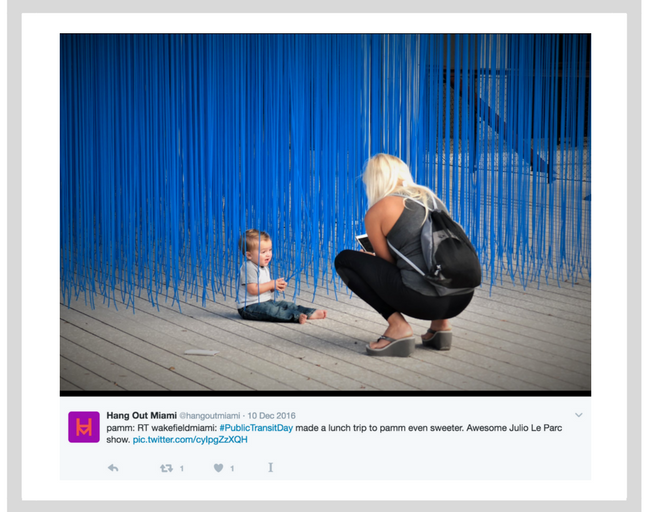 One of the biggest surprises for our team was the reach and exposure #PublicTransitDay received on social media. At day's end, numerous cities across the globe had picked up on #PublicTransitDay and joined us in celebrating mass transit! Cities worldwide caught on to Public Transit Day and joined in on the action. We learned a lot about your transit experiences through social media. Twitter polls provided insight on what improvements might be priorities for locals. We heard about some great transit experiences and some not so great ones. While some of you had a seamless ride, others experienced late trains/busses, long commutes and difficulty getting to your first transit stop of the day. All in all, Public Transit Day was a tremendous success. Transit users new and old experienced the transit system - celebrating its wins and feeling all of its pains. Beyond their personal experiences on transit, elected leaders heard from YOU, their community, that you care about this issue - not only because you care about traffic congestion, but because you care about equity, the environment and the economic vitality of our city. < Back to Part 1 | How Did Public Transit Day Come To Be?